We all like the taste of mineral-heavy water, and with the state of today's public water systems, health need always be at the top of mind when considering a filtration system to protect yourself and your family. Of course, buying a filter and replacing it every 6 months is frustrating and expensive. And while Reverse Osmosis filters remove harmful minerals, they also remove essential ones, resulting in dead water. The Woder® 10K leaves these essential minerals, leaving clean, crisp water how it's supposed to be. What if you could get a filtration system that transformed your water into completely clear, beautifully filtered water that tasted and smelled more pure and fresh than ever? And what if this filtration system needed only to be replaced approx. once every 10,000 gallons (Compare that to standard under sink water filters that have an average life span of only 6 months to 18 months and 1,000 to 5,000)? Introducing the Direct-Connect Water Filtration System Premium Class 1 by Woder®. This high-quality water filter eliminates chlorine, bad tastes and odors-not to mention lead and other heavy metals-so you and your family can enjoy safe drinking water. Fresh, clean water for years, without worry. Isn't that what we all deserve? Try the Direct-Connect Water Filtration System Premium Class by Woder® free of risk with our "you'll-love-it" guarantee now. Don't wait any longer. BUY NOW by clicking the "Add to Cart" button at the top of the page! Please note: TDS meters (or PPM) are not an effective to way to check this filter and not an effective to way to check or test water. TDS meter are known to also pick up ions. Essential minerals are also picked up by TDS meters. NO MORE BOTTLES IN THE FRIDGE. Eliminate Lead (99.9%), Heavy metals, Chlorine (99.9%), Chromium 6, Volatile Organic Compounds and other contaminants (99.9%), odors and bad tastes, Mercury and turbidity. The Woder® 10K gives great smelling and tasting water, cold and fresh from the tap. ALL SET IN FIVE MINUTES.. Woder® 10K comes as a complete assembled kit. Includes: Filter body, inlet hose - 3/8 female compression by 1/4 standard pipe thread, outlet hose- 3/8 m compression by 1/4 standard pipe, clip and screw. BEST FILTER YOU'LL EVER BUY. Remove the worst-offending minerals while allowing essential minerals natural in water to pass through unaffected. Amazon's best-rated water filter, the Woder® 10K will last for up to 10,000 gallons, or roughly three years of use! Enjoy a strong flow and easy stream from the world's best under sink filtered water. 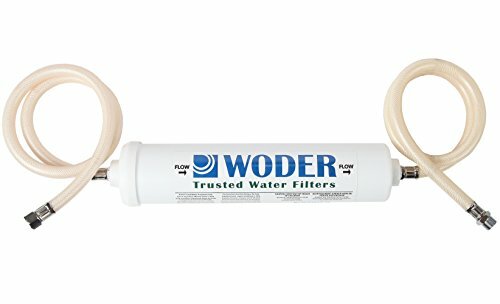 Woder filters are built with NSF approved materials (NSF61) tested by independent laboratories to NSF/ANSI 42 Protocols plus lead so you never have to question the quality of your filtration system. The "YOU'LL LOVE IT" GUARANTEE: Our money-back guarantee is as clear as our water: either you love it, or you send it back for a refund. Use with municipal treated cold water only! (Do not use with hot / salty / softened or well water). Flow Rate 3GPM @65 psig. If you have any questions about this product by Woder, contact us by completing and submitting the form below. If you are looking for a specif part number, please include it with your message.